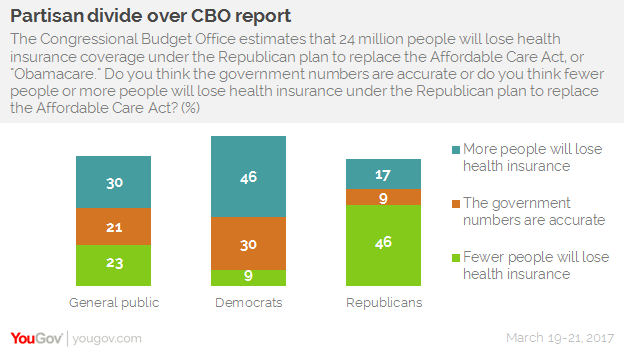 March 23, 2017, 5:15 p.m.
Public opinion about the Republican health care reform bill (American Health Care Act) remains partisan, with little change in judgments after the Congressional Budget Office reported that up to 24 million could lose health insurance coverage in the next few years. 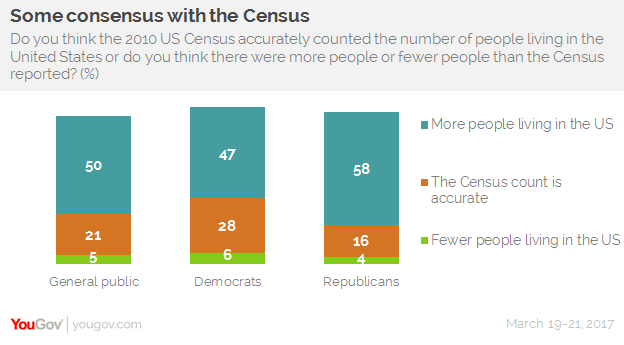 That partisan divide has been evident in Economist/YouGov Polls since the introduction of the Affordable Care Act/Obamacare in 2009, but partisanship also plays a role in how people view the output of the CBO and other agencies that provide important government statistics, such as the jobless rate and the Census count. Many Americans pick and choose the statistics they believe, with Republicans generally more skeptical. But while public skepticism takes on a partisan tinge on health care reform, Democrats and Republicans have similar reactions to some other government statistics. A majority of Democrats think all or most government statistics are reliable, but fewer than half as many Republicans agree. 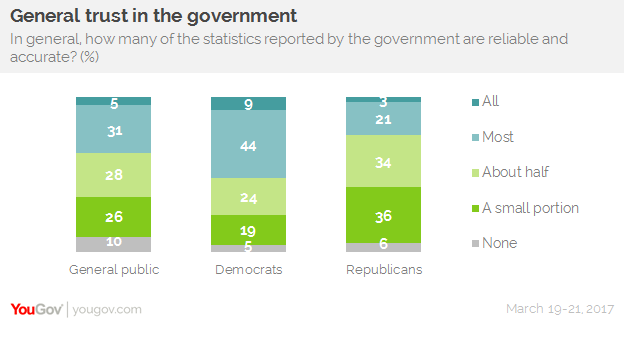 42% of Republicans believe few or no statistics put out by the government. 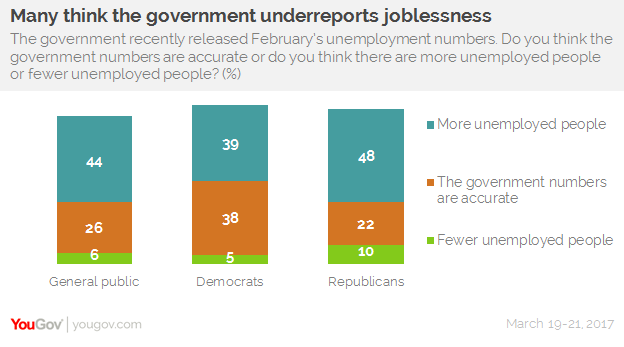 But both Democrats and Republicans quarrel with other government statistics: pluralities in both parties say the Census Bureau undercounted Americans in 2010, and there are many who think the Bureau of Labor Statistics underreports joblessness (some of the latter concern may have to do with confusion over the BLS definition, which does not include those who are not in the labor force in the monthly unemployment rate’s denominator). 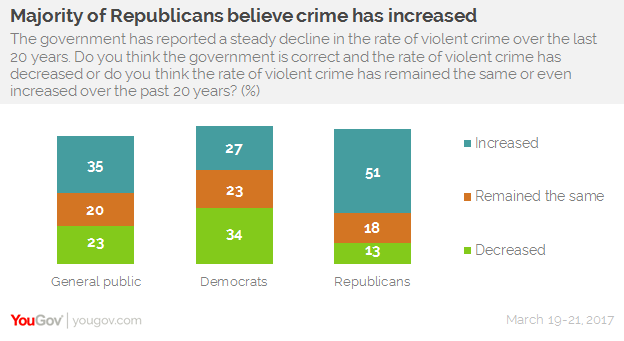 Republicans, meanwhile, are much more likely than Democrats to say the crime rate has increased, not decreased, in the last 20 years. Just over half the public expects that Obamacare will be repealed, and that it will happen at some point in 2017 (though only one in 10 think it will happen in the next 60 days). 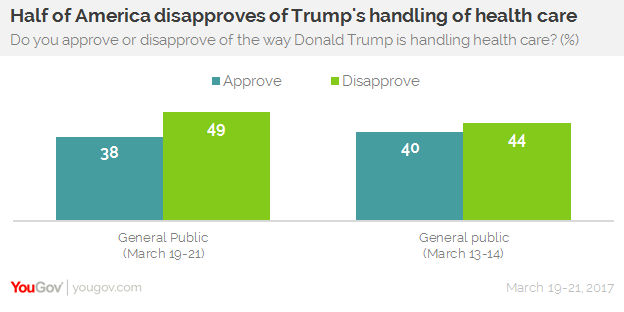 As for the GOP&apos;s proposed changes to health care, the public disapproves: 31% support the changes to health care developed by Congress and the Trump Administration; 45% oppose them — about the same as last week. But President Trump and House Speaker Paul Ryan may be paying a price for health care conflict. The President’s overall approval rating has changed little this week compared with last week: 41% approve of how he&apos;s doing his job; 46% disapprove. 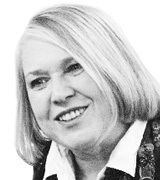 But there has been change in how the public views his performance on health care. Last week, Americans were closely divided; this week, they disapprove by a double-digit margin. As for Speaker Ryan, this week half the public has an unfavorable opinion of him, up six points since last week. Less than a third are favorable toward the Speaker. Republican favorability towards Ryan has dropped 11 points in the last week — though 58% remain favorable, that’s down from 69% a week ago. 28% of Republicans now are not favorable, up 10 points in a week. Republicans and Democrats are both likely to believe government statistics when it comes to warming global temperatures — pluralities in both parties say the NASA and NOAA reports are correct. And in the last few years of Economist/YouGov polling, Republicans and Democrats have agreed that climate change is taking place. The difference now, as it has been, is whether or not this is something that human activity has a role in causing. Three in four Democrats say human activity is to blame, while just 29% of Republicans agree. Overall, 52% of the public say the world’s climate is changing because of human activity.